Our goal during these various community outreach functions is not only to raise monetary support, but most importantly, to educate the public. We discuss horse care, basic needs, expenses, abuse and neglect. Our presence has opened many eyes and brought a wonderful group of individuals together. All of us are doing our part to change the lives of these magnificent creatures and ultimately preparing our upcoming generation with the knowledge and skill to more appropriately make horse ownership decisions. If you would like to become a part of this change and touch the lives of our beloved rescues, just click the contact button at the top of your screen, list your area of interest in the comments section and one of our board members will get back with you on details to get you started! Bring the family out and stop by the HOPE grill for lunch! We will be serving hotdogs and drinks. Stay and chat with one of our volunteers and hear about all of the exciting things happening at the farm. Let us share with you our mission and show you the lives that have been changed. Want to get involved, but not sure how. Make an appointment to tour the farm, talk about fundraising or what amazing talents you have that can help with our community outreach. All proceeds/donations received at our booth go directly toward our rescue efforts and the rehabilitation and care of those on the farm. This venue is always a treat for kids and adults of all ages. Come out and try your navigation skills or just get lost in the corn maze! Enjoy lunch, visit the Farm Zoo, stop by the Pumpkin Barn, try your hand at the Apple Slingshot, take a stroll down Scarecrow Alley, take a ride on The Hope Express and bring the kids by our booth for a pony ride. This is sure to be a great family event for all! All proceeds at our booth go directly toward the rescue, rehabilitation and care for those on the farm. It's that time of year, the fair is in town. Stop by our booth in the Agricultural Building on the weekends. You can get information on adopting, volunteering, sponsorship and how you can get involved. 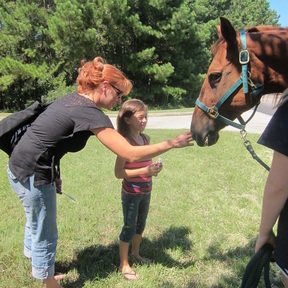 We will have a few of our rescues in the stables for you to meet! This is always a fun, family event in the Lowcountry and we are grateful to be a part of it this year. Celebrate The Season is a holiday lights festival that keeps on giving, with all gate proceeds donated to charities serving Berkeley County. The lights driving tour and weekend festivals start Nov. 27th at Santee Cooper headquarters and the Old Santee Canal Park. Stop by the HOPE Acres Rescue tents next to the house on the hill and grab a hot coffee, cider, soda, bowl of soup or entree of the evening. You can also shop our craft tent and purchase a few Christmas gifts while you are there. All crafts and creations have been handmade and/or donated to the rescue with all proceeds benefiting our rescue and rehabilitation efforts! Bring the entire family. This event is a must see during the holiday season. See you there! Merry Christmas from all of us at H.O.P.E. Acres Rescue!